In her oral histories, Svetlana Alexievich orchestrates the voices of Russians trying to reconcile the irreconciliable. As soon as I read the first chapters of Svetlana Alexievich’s Second-Hand Time, I knew that I absolutely had to translate this book and make it available to the greatest possible number of readers. Above all, Alexievich’s oral history gives us a picture of Russia and Russians that is far more insightful than what we typically find in the media. By deepening our understanding and lending nuance to our views of the country and its history, it encourages us to go beyond prejudices, clichés, and set opinions. This essay first appeared (in a slightly different form) in the web publication Contreligne in December 2013 and was translated from the French by Alice Kaplan. Second-Hand Time is the fifth volume of a vast literary fresco, a representation of the Soviet Union and contemporary Russia according to the testimony of ordinary people. The previous volumes in the series are Zinky Boys: Soviet Voices From the Afghanistan War (the conflict as seen by soldiers and their mothers); War’s Unwomanly Face (World War II from the point of view of women who fought in the Russian Army); The Last Witnesses: The Book of Unchildlike Stories (the memories of Russians who were children during the Second World War); and Voices From Chernobyl (on the nuclear disaster and its aftermath). Now, finally, comes Second-Hand Time, in which everyday Russian citizens speak about their experiences over the past 20 years: the fall of the Soviet Union, the decline of communism, and the emergence of contemporary Russia. To create her fresco, Alexievich interviewed hundreds of people who are rarely given the opportunity to speak, collecting the traces left in their lives and memories of more than 70 years of communism and what it wrought: not only massacres, decades of terror, the absence of freedom, the deportation of entire peoples, the famines, and the denunciations—but also the hope brought first by the revolution and then by perestroika, the crazy idea of changing the world completely, the intoxicating freedoms of the 1980s, as well as the disenchantments and the aborted dreams. Among the tasks that Alexievich set for herself was to tell the story of communism as people experienced it day by day, but to remain as neutral as possible. She intervenes only at the beginning, in a section titled “Notes From an Accomplice,” and then parenthetically from time to time during the testimonies. The stories assembled in this book raise questions that have no fixed answers: Why do so many Russians miss the Soviet Union? What do they miss about it? How could anyone have been happy in a country where you were always subject to the whims of power, where you were constantly asked to make sacrifices in the name of a future that was never coming? What are the advantages of placing one’s own freedom in the hands of a party, a tyrant, or a state? Why do Russians have so much trouble living with freedoms, personal or political? What traces have been left by the communist regime? How do people in Russia today understand what they’ve lost and what they’ve gained? Why is Stalin so popular now, embraced especially by young people? What are the mechanisms of oppression, and how are they able to take hold from one day to the next? I’ve known Alexievich for 20 years, ever since I translated her book Enchanted With Death, now out of print, which she has come to see as an early version of Second-Hand Time. Translating Second-Hand Time was an honor, but also an enormous pleasure, for it is truly a beautifully made work of literature. There is nothing worse than translating a badly written book. Or perhaps there is: translating when you feel no strong connection with the author. A translator who has to live with an author for months and explore her work deeply becomes very close to her. Here, I must say that I’ve been lucky: Svetlana is an extraordinary person, ex­tremely subtle and endowed with an enormous capacity for empathy, which you can sense in her writing. How else could she have gotten people to speak about such intimate and painful subjects if she didn’t have the gift of true compassion (in the strongest sense of that word) for their suffering and their dreams? But she possesses many other equally important gifts. She is able to encourage the people she interviews to put into words—their own words, often colorful and poetic—thoughts and emotions they had scarcely been conscious of, and which they often discovered for the first time during the conversation. This is a kind of midwife’s gift that requires true listening and a great respect for others—even if, as Alexievich maintains, the simplest people naturally and instinctively use language that is rich and dense when they speak about love, death, suffering, or evil. I’ve sometimes been asked if the people in this book really express themselves this well in the Russian original. The answer is yes—in fact, I never “fix” what I translate; I try to remain faithful to the narrator’s language. And in my experience, so-called average Russians generally speak their own language better than, say, their counterparts in France speak theirs. Russians still express themselves the way the French did in the 1950s, in a language more correct and complex than the French usually spoken today. Alexievich also possesses a gift for transcribing these voices, knowing how to respect each person’s intonation and inner music—the gift of seizing the moment when, as she says, “life is transformed into literature.” This is truly a writer’s talent. She knows how to make the words and language sing, and she is able to capture the breath and cadence of the sentences, which I have tried to render in my translation. 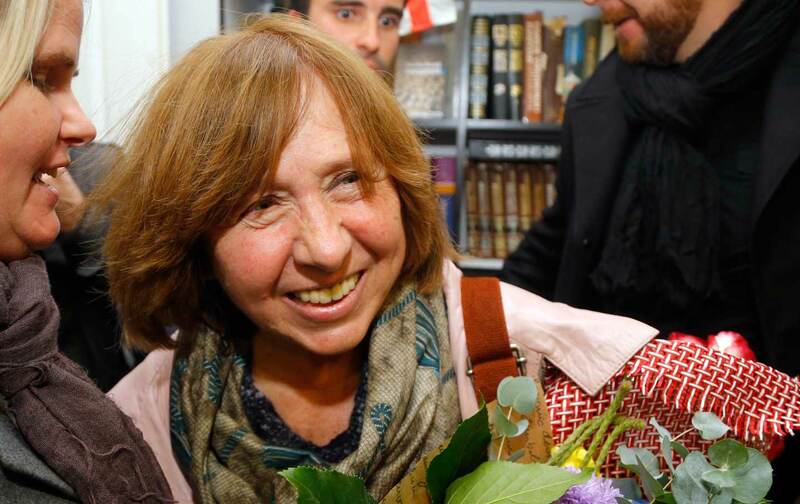 Another talent indispensable, in my opinion, for any writer: Alexievich doesn’t lecture. She is much more interested in asking questions for which she has no answers. This is perhaps what gives her book its power. Readers are left to draw their own conclusions, to reflect upon what she shows us, to follow the paths she suggests. As Cocteau once said: “A good book should leave you prickled with question marks.” Her book goes further still: It eliminates in its readers any desire to judge and incites them to share the point of view of people who are opening up their hearts, with all the contradictions that this implies. For “chemically pure evil does not exist,” and things are more complex than they seem from afar, without having experienced them in the flesh. I was struck by one aspect of these testimonies: People often contradict themselves from one page to the next, arousing our surprise, our confusion, and sometimes our indignation. How can a man, after having been unfairly imprisoned and knowing that his beloved wife was arrested, tortured, and murdered by the Stalinist system, weep with joy when this same system has the generosity to give him back his party membership card? How can a woman, after having spent a childhood of horrors in a zone of the camp where her mother was imprisoned as an “enemy of the people,” miss the days when Russia was the Soviet Union? These contradictions make the book’s testimony all the more humane and honest. “There’s nothing but truth in it, and so it’s unjust,” writes Dostoyevsky in The Idiot. Alexievich, to whom Dostoyevsky matters greatly, quotes in her preface from the parable of the Grand Inquisitor in The Brothers Karamazov. Alexievich isn’t looking for truth with a capital T (which doesn’t exist anyway), but for all of the smaller truths of the people who have lived, dreamed, loved, and suffered in her country. For many of those years, they lived under an inhuman system founded on a vision of utopia that they more or less believed in, and so they tried to reconcile themselves with the irreconcilable. And yet Second-Hand Time is not just an extraordinarily rich portrait of Russia and Russians: While the book is devoted above all to the innumerable tragedies experienced by the people of the Soviet era, it can touch anyone deeply—even those who aren’t particularly interested in Russia and its history. Through the voices of those who confided in her, Alexievich tells us about human nature, about our dreams, our choices, about good and evil—in a word, about ourselves. The themes she tackles here are universal—freedom, love, death, choice, faith, betrayal, disappointment, fear, suffering—and they are broached not from an abstract or philosophical point of view, as a vehicle for big ideas, judgments, or sermons, but in a concrete and lively way, through little brush strokes and personal details, just as they are embodied in everyday lives. We enter here into history and philosophy writ large through the small door of stories and individual reflections. And the substance of these reflections concerns us, too: How can idealists who fight for the happiness of humanity torture and massacre mercilessly in the name of their ideals? How can someone be both victim and executioner, one after the other, or both at once? Why are we so easily fascinated by an idea—or ideas—to the point that we sometimes refuse to see what is right in front of our faces? Why do we love dreams and falsehoods so much? What does fear make us capable of? And what happens when we insist on being right? Why do so many among us want to be taken care of first and foremost, preferring comfort and happiness in slavery—imposed or self-inflicted—to the responsibilities that come with freedom and choice? What can save us when all hope has disappeared? What remains human in humankind, when everything has been done to destroy it? Svetlana Alexievich once said that when she interviews, she tries not to have the kind of conversation in which you exchange information or argue ideas or points of view. Instead, she tries to have authentic conversations in which people share the experiences that made them who they are, that forged their destiny and their being at a deeper and more vital level. It seems to me that she reaches her readers at that same level—and for this reason, among others, her book moves us. Sophie BenechSophie Benech has translated many modern and contemporary Russian authors into French, including Isaac Babel, Leonid Andreiev, Ludmila Oulitskaia, and Iouri Bouida. Svetlana Alexievich’s Second-Hand Time (originally La Fin de l’homme rouge, or “The End of the Red Man”), which Benech translated, won the 2013 Prix Médicis for nonfiction. It will be published this spring in the United Kingdom by Fitzcarraldo Editions, in a translation by Bela Shayevich.